By analogy, in the US, when Agency Lite was brought into existence, Kobo saw its net revenues steadily decline. Kobo has since stopped investing in marketing in the US, closed its office in Chicago and is focusing on other markets. 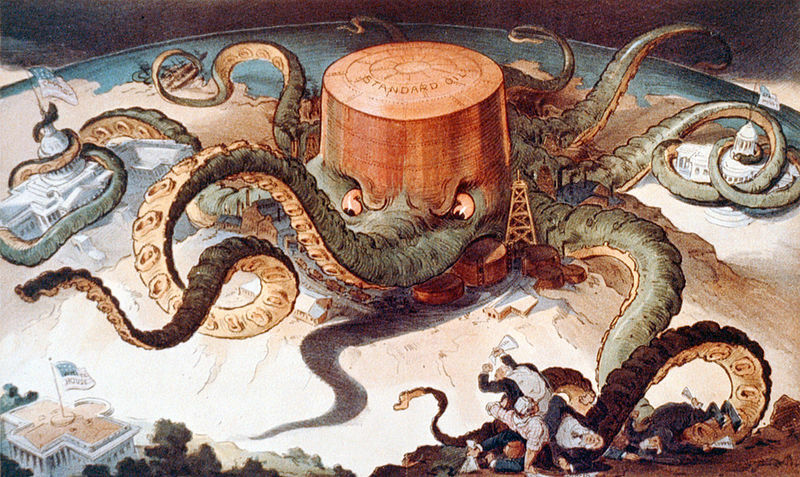 Its market share and revenues are now negligible there. Well, there it is. What I’ve thought was the case for at least the past year. B&N’s Nook division goes into a death-spiral of losses. Sony pulls out and sends it eBook customers to Kobo. Now Kobo is saying it has basically written off the American market. That leaves Amazon as undisputed winner. 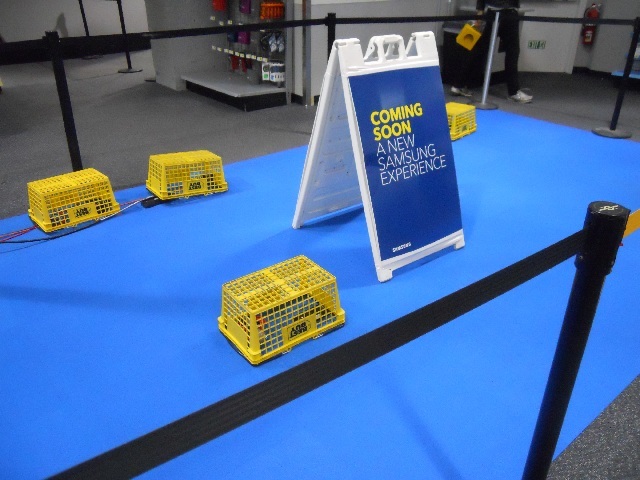 Part of yesterday’s Tech Fondle Tour was a trip to Best Buy. 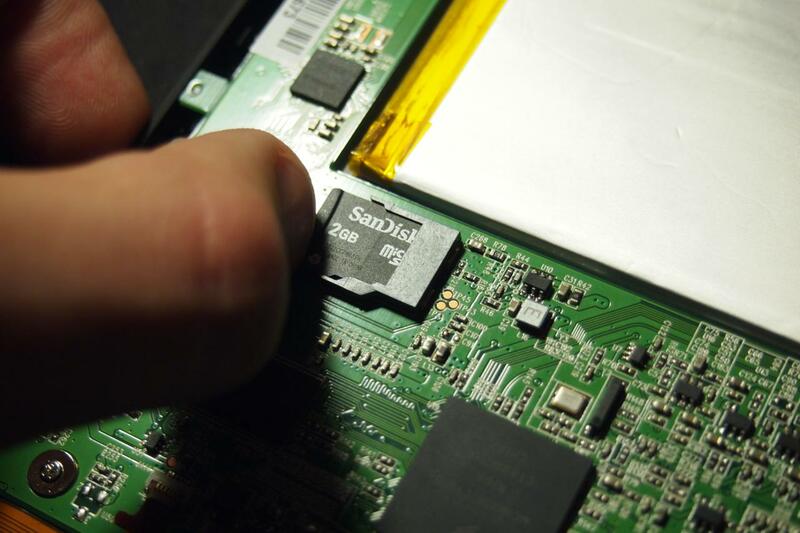 An adventurous guy in Italy opened up his Kobo Glo and discovered everything resides on an internal 2GB microSD card! He provides detailed instructions on how to swap out that microSD card with one of larger capacity. It’s not an operation most people will try. It will also likely void the device’s warranty. The internal card trick was also used in the first generation Nook. This makes me wonder if the Kobo Aura HD has the same thing. Around the world, the two people who still pay attention to Kobo were awakened from their slumber when the company announced a new eInk eBook device with a hi-res screen and premium pricing, shockingly called the Kobo Aura HD. I joke a bit. Kobo doesn’t make the waves of Amazon or have the Deathwatch popcorn-eaters of Barnes & Noble/Nook Media. I am surprised they’ve done a new eInk device, however. 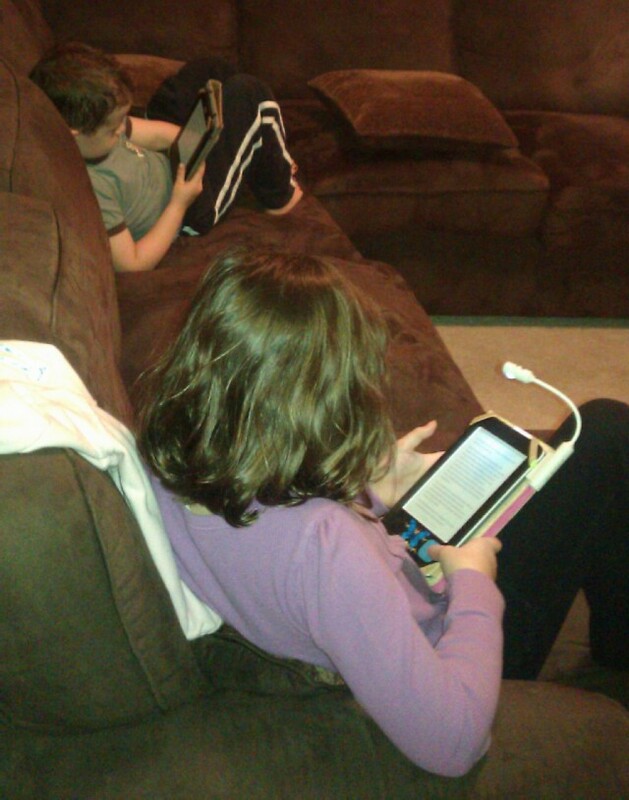 I wonder what Nook Media and Amazon make of that? What would have excited me is if this had been based on Android. But there’s no sign of that in the specs. Having Android would have put a big hurt on Nook Touch sales. Update, Monday April 15, 2013: Kobo has a promo video. See it after the break. Some background: ACCESS is a Japanese company that has been around for quite some time. Its NetFront web browser was very popular pre-iPhone and was also so far ahead of all other mobile browsers that Jeff Hawkins’ Handspring licensed it. Sony also chose the NetFront browser for its line of CLIE PalmOS devices. The short version is that it would be good for Kobo first and for everyone else second. 1) Adobe can’t do it. And if they did, it would be for an elite, just as InDesign is, with its whopping price of $699.00. That is a tool made for the classes, not for the masses. 2) Kobo would benefit first of all by giving people a tool that would do the conversion Kobo itself currently does of changing ePub into their own Kepub format. This would free up resources at Kobo. 3) Kobo could also sort out the metadata mess. This tool would help everyone input the metadata that Kobo currently has to fix over and over and over again from assorted sources. This would again free up resources at Kobo. 4) Kobo would especially benefit by attracting writers. I would do this by pricing it at $99.00 for anyone — but free for those who publish at Kobo. Amazon currently attracts the most self-publishing writers. This would be Kobo’s opportunity to level the field. 5) Kobo would have a huge competitive advantage against both Sony and Barnes & Noble. Although the tool would output standards-compliant ePub 3 which could also be published at those stores, the chances are that most writers won’t bother since it would be a simple button-click to upload to Kobo via the app. 6) Kobo would finally be seen as having a leadership position in eBooks. Right now, Kobo is easy to fall off the radar — as it did in my case. Such a tool would change that, permanently. I could go on, but I think these points alone should be compelling enough for Kobo’s executives to seriously consider the wisdom of developing such a tool. There is a void out there right now. Kobo can fill it and win. Continuing with my big fondle tour of yesterday, I tried to do: Kindle Touch, Nook Touch (again), and — finally! — a Kobo Touch. 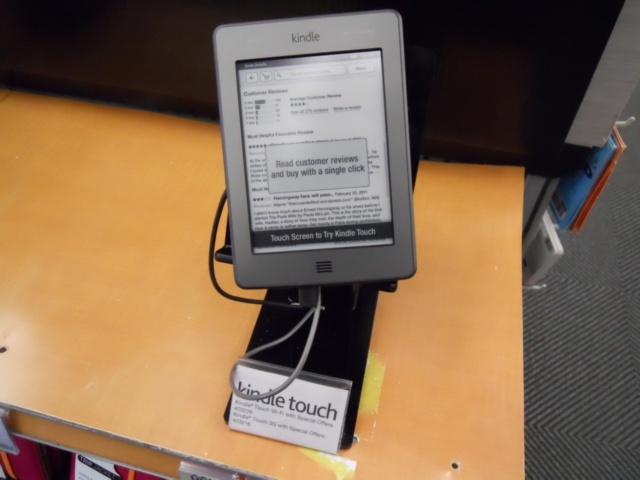 I encountered the Kindle Touch at Staples. It was complaining of a low battery (not photographed). So was the nearby Nook Touch, which couldn’t even be powered on! Of course, the Kobo app now has a zillion one-star reviews due to loss of the store with no explanation. Apple's very happy now, no doubt.